Все видео пользователя: Ян Али. В этом видео покажу вам как можно своими руками в гараже покрасить автомобиль. Это мой первый видеоролик на эту тему. Смотрите остальные ролике по подготовке на моем канале. благодарю за внимание. Greatngs my friends desided to release. 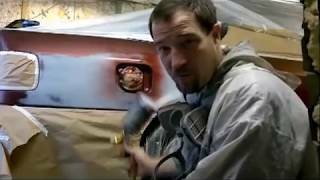 A video about what cars i do repair and paintso today we have an Audi. 100a6 so there was some rust on lower side of the. Doorsunder the moldnd there was so mucch dirt?it wasnt washes as often as. It should be so the rust took over/somwhere there was some scratches /we had filled those. And primered.and also we took of the front wiebd shield to repair some rus on the roof.some. Time ago this wind shield weree changed and some scratches where maid so it started the. Corrosion?it was so horrible it had a leakage inside of a car.we wil paint. Half of the roof because it too big,this side also had a coroosion.idea is such i wanted. Show that i panting in an ordinary garage,so wet all floors with a water do not sweap bekause. All dirt flies in air.